Presently, 50 years after Gershom Bradford wrote those lines, the very same painting of the wrecked Hercules hangs a room away from me. And a digital image of the painting, something Capt. Bradford never could have imagined, hangs before me on my screen as these lines are typed. Living in a coastal town, I tend to ponder such scenes with the approach of a big storm. As Hurricane Sandy bears down, I shudder a bit to think of mariners, past and present, caught up in such danger. I really don’t much enjoy being on the water even in fine weather. I have no particular fear of the ocean. I just wonder why people would choose to be on it when one could have feet on safe, dry land. I know, there are reasons on a bright, sunny day with a fair wind. I just don’t quite get them. 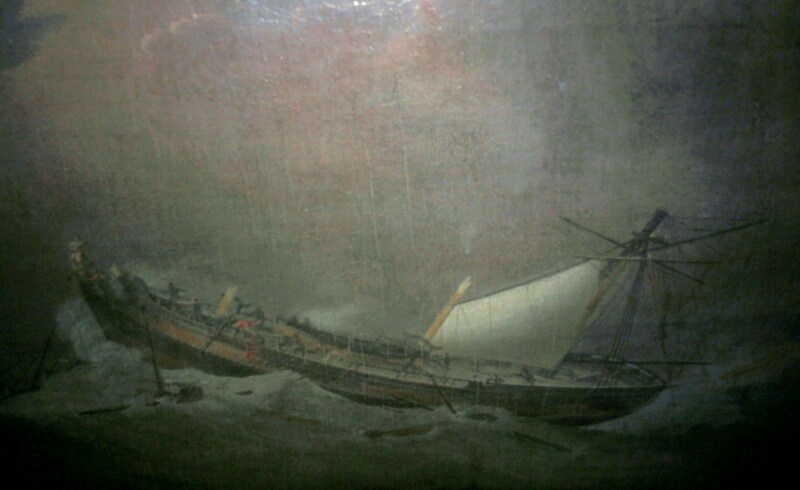 Of course, no one chooses to be caught up in a storm such as the one that nearly sank the Ship Hercules on September 26, 1809. Least of all Sarah Drew Bradford, 38 year-old wife of Captain Daniel Bradford. Both of them were from Duxbury, Massachusetts. Her husband was an experienced and well-known master mariner having met dangers beyond storms…such as the British Navy and French privateers. Sarah’s letters describing the dismasting, written to her sister back in Duxbury just days after the dangers were passed, paint a heroic picture of her husband, the captain. I have little doubt that Capt. Daniel Bradford was every bit as intrepid, cool and skilled as the letters represent. Still, I can only imagine the experience of trying to keep one of these big sailing vessels afloat amid gales and massive sea swells…no matter how experienced the master, it must have been terrifying. Nor can I quite grasp the level of Sarah’s fear as she huddled below deck, listening to the sounds of the ship falling apart and catching what shreds of information she could from mariners scurrying here and there. Last Tuesday it was a shocking storm and our ship was dismasted…Mr. B [her husband] says it was the heaviest he ever experienced…The gale had abated for a few minutes and I had begun to hope the worst was over, when a sea struck her in the bowsprit and we broke that close to the bow and with that went the foremast and in a few minutes the mainmast. There was a man in the foretop but he was saved providentially as well as the rest of us, and one in the shrouds, he jumped on deck and lamed himself…The horror of the scene was more than I can express or you imagine unless you was to experience it and God grant you never may. The crew managed to secure the vessel, the storm abated, and they limped along under jury-rigged masts for several days. At that point, insult was added to injury. The HMS Ramillies, a 74 gun, third rate ship of the line, took the damaged Hercules as a prize. Given the condition of the vessel, the Americans were helpless to do anything about it. Captain Bradford was taken on board the warship with all his papers. A prize master and several “ill looking fellows” of the British Navy were put on board the Hercules and the ship taken into tow. “At first I was pleased,” Sarah Bradford wrote, thinking they would soon be in London and safe. But the Ramillies proceeded to pursue other prizes, running one vessel aground. And the British master, Sarah wrote, was “full of rum the whole time” (although we might take that with a grain of salt) and apparently, through his recklessness, caused at least one collision of the two vessels while the Hercules was in tow. Sarah mentions they were quarantined in London, but whether the vessel was returned to the Americans, or how they eventually came back to Massachusetts in unclear. Now, in 2012, it is the calm before the storm here. I hope things do not grow too severe. Tonight, I’m sure, as I listen to the wind, I’ll be thinking about Captain Bradford, Sarah, and the many who once faced, and still face, such peril on the sea.